China's ZTE, which the US government has accused of repeated sanctions violations, has paid a $1 billion fine, a US Commerce Department official said Friday. The payment comes days after President Donald Trump tried to persuade two dozen lawmakers — mostly Republicans — that the fine and the assignment of an American monitoring team would be sufficient punishment for ZTE. ZTE will also put $400 million in an escrow account in the coming days, according to the Commerce official. That money is meant to give ZTE an incentive to comply with trade rules going forward. The White House and Congress have been at odds over the company, which makes smartphones and is China's second largest manufacturer of telecom equipment. Some lawmakers want stronger penalties imposed on ZTE, which they see as a security threat. Trump wants to keep the company alive as a bargaining chip in the broader trade spat with China. This week Trump met with lawmakers at the White House to discuss a provision in defense policy legislation that would reimpose a ban on ZTE doing business with its US suppliers. Doing so would effectively shut down the company, which employs around 75,000 people. Republicans and Democrats have been united on attempting to block Trump's deal to lift sanctions on ZTE. Trump told reporters "we're working on it" when asked about his efforts to sway lawmakers who object to the deal. 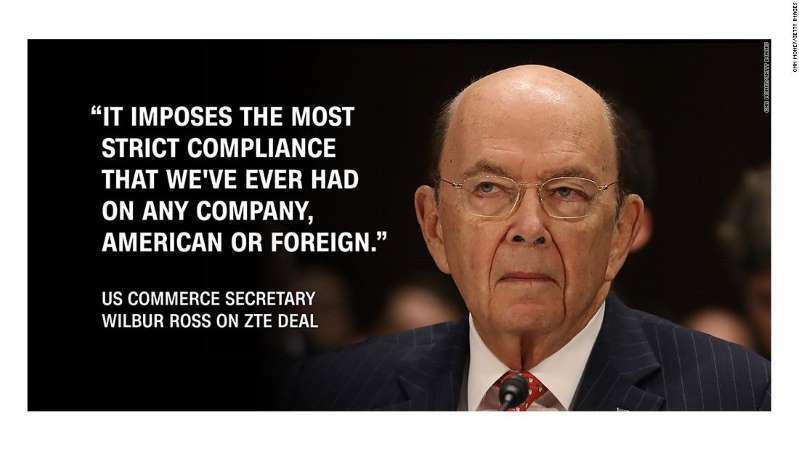 Earlier this month, Commerce Secretary Wilbur Ross announced a deal that would end a ban on ZTE buying American parts, provided the state-controlled company sticks to the terms. ZTE relies on the American tech sector for its products, buying chips from Qualcomm, Intel and other companies. Ross said the deal would impose "the most strict compliance that we've ever had on any company, American or foreign." The payment of $400 million in escrow will be the last step before the ban is lifted. In April, the US Commerce Department blocked American firms from selling parts or providing services to ZTE. The ban brought ZTE's factories to a standstill. Weeks later, Trump opened the door to working with Chinese President Xi Jinping in a tweet.